Putting on a baby wrap can be a challenging fete. Have you ever seen a baby in a wrap and think how in the world did the mom or dad wrap that thing?? If you’re new to babywearing, you may be wondering how to put on a baby wrap. Below are some of the videos I used when I was first learning how to babywear in a wrap. READ: Which Baby Carrier is Right for You? Tip! If you are new to this, try these techniques with a stuffed animal or a baby doll. It might be helpful to have a friend nearby or to be over a couch or bed. You may also find help at a local babywearing group, like Babywearing International. Note: I am not an expert in all of these wrap techniques. I cannot tell you what is best for your baby. Please make the best judgments when it comes to how comfortable you are in some of these wrap techniques, for the safety and security of your baby. Also, some of the videos may contain ads. I do not receive any compensation from these, but some of these mamas might at no cost to you. My own affiliate links are below, from which I may earn a small commission at no extra cost to you. Thanks for your support! Before You Begin: What Kind of Baby Wrap Should I Buy? 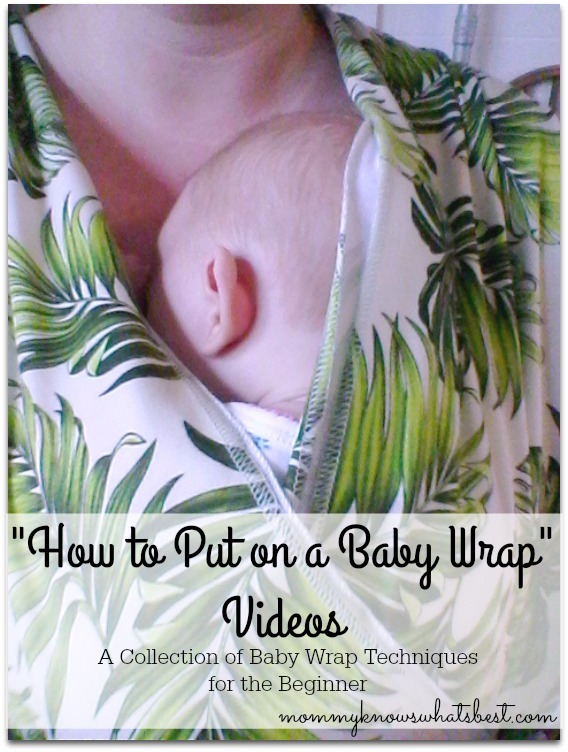 Before you learn how to put on a baby wrap, it’s helpful to have a wrap! Most people will start off with a stretchy baby wrap, like a Moby Wrap or a Boba. There are also woven wraps and even water-friendly wraps, like the Beachfront Baby Wrap. What you decide to buy depends on how you want to wear your baby, even though most of these can be used for all kinds of wrapping techniques. Usually, the woven wraps are best for back carries since you get a great seat and more stability from the fabric than you would from a stretchy wrap. Read some reviews and watch some videos to get a sense of what you’ll get the most use out of. I have both a Moby Wrap and a woven wrap. I also have a Beachfront Baby Wrap for the warm summer months and for swimming. This is one of my favorite holds for a newborn. It’s the newborn hug hold. It keeps baby warm and snug right up against your chest in the closest thing to fetal position. If you have a Moby or any other wrap, this is a great way to bond with your newborn. A Moby Wrap is a great starting wrap, but there are other wraps as well, including woven wraps, that can also be used for this carry. This is another front wrap carry that is great for newborns. The starting point of the wrap is different from that of the cross carry, so pay attention! A cross wrap carry is another front carry method for babies. For older and heavier babies, a cross wrap carry is a bit more comfortable, in my opinion. I started using this wrap method once my baby girl weighed over 10-12 lbs and had better head control. This video shows both a front cross wrap carry and a back cross wrap carry (suitable for 1-3 year olds, but can also be done with younger babies 9 months+). Also, pay attention to the very helpful baby wearing tips in this video! Isn’t that woven wrap beautiful? Notice how she takes her time and makes sure that the wrap is securely in place for both carries. You don’t want baby to fall out! For larger babies, a hip carry is preferred by both parent and baby. At that stage, since the baby is longer, some parents want to avoid head butting (it hurts…oh, does it hurt..). Babies at that age also like to look around more but also have a shoulder to rest on. This is a demonstration of a hip wrap cross carry with a baby who is about 24lbs. If your baby is wiggly like this little one, try to have a spotter or wrap over a couch or bed, just for extra protection. For babies who can sit unassisted and have great neck control, a back wrap carry is possible. This is NOT recommended for newborns or babies who cannot sit on their own or support their necks. This is different from the video above as she shows how to scoot your baby onto your back from the side as opposed to the superman method. This is different than a cross carry, shown with a hipscoot. Again, this is for older babies who have good neck control. As she suggests, try this first with a doll or stuffed animal to get a feel for it. This is finished with a basic knot, but see the finishes in the next video below. Have you ever seen the pretty finishes or knots that some people create with their wraps when they back carry? Here is a whole list of them with a rucksack carry. This last one is a double hammock back carry, again for a baby with good neck control. I like that in this video you can see the baby struggle and how the mom had to readjust to make sure the baby is as safe as can be. These are just some of the more basic baby wrap carries. You can find more with a simple Google search! Try these first before moving on to the more complicated ones. Be sure to share this with friends who want to learn how to put on a baby wrap! Tell me: Which is your favorite baby wrap technique? Did this help you learn how to put on a baby wrap? Do you have another recommendation? Leave a comment below! These are excellent videos. With all the options available, it would be tough to know how to use each one. It is easier to learn this way than reading on a package for sure.